Mark Baines, MS, MBA, PFT, CSCS, PES, received his Bachelor of Business Administration Degree (BBA) in Business Management in 1993 from Gonzaga University. He also obtained secondary teaching certification in social studies at Gonzaga and secondary teaching certification in English from the University of Washington. He obtained his Master of Science Degree (MS) in Exercise Science and Health Promotion from the California University of Pennsylvania in 2006 and received his Master of Business Administration Degree (MBA) in the Executive MBA Program at California State University, Fullerton with an emphasis in finance and marketing in 2009. He currently holds certifications as a Certified Strength Conditioning Specialist (CSCS) through the NSCA and holds training certifications and specialist designations from the NASM (PES), NESTA (PFT), ISSA (CFT), and NCCPT (CPT). He worked as a junior high teacher, high school basketball coach, cross-country and track coach for more than five years before working as a personal trainer and strength coach for the last 16 years. He taught social studies, English, math and computer applications for 4 years in Seattle, WA before moving to southern California to train for the 2000 Olympic Games in Sydney, Australia. Mark ran at the collegiate level at Gonzaga University, but his times fell short of the 2000 U.S. Olympic Trials. He now instructs fitness boot camps, corporate fitness programming, and youth speed camps and clinics throughout Orange County, CA. He has instructed and led workshops as a master instructor for personal fitness trainers in the United States and Asia through NESTA and the NCCPT. He presents annually at industry trade shows and conferences across the United States such as Club Industry, IDEA, IDEA Personal Trainer Institute, and many others. 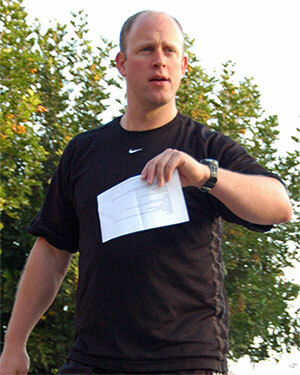 Mark is the owner of and primary instructor for Training Made Fun since its inception in 2009. Geoffrey Myers, BS, KT, PFT, has over 20 years experience as an athlete, coach, therapist, and functional performance analyst and advocate. A graduate of Cal-State University at Long Beach with a B.S. in Kinesiotherapy and a certificate in Kinesiotherapy (30 units of 500 level courses plus 1500 hours internship), Geoffrey also holds certifications from the Functional Fitness Institute as an instructor and the National Pitching Association on advanced pitching. Geoffrey has 180 units in credited courses (emphasis in the fields of motor function, biology, neuropathology, and psychology), and is currently working on his M.S. in Motor Development and preparing for a national board exam to become a Registered Kinesiotherapist. His athletic résumé includes a record of achievement and excellence in youth, prep school, and collegiate sports such as baseball, hockey, football, and soccer. In addition, he has won awards in most other team and individual sports. He also specializes in all Four Performance Absolutes (Biomechanical, Physical, Nutritional, and Mental/Emotional realms) and creating parity among them, which sets him apart from most others in the field. These specializations have allowed him to impact numerous athletes’ performances from the Olympics, World Series, and PGA events to local parks, rinks, and fields in all most every sport and activity. Serving as strength and conditioning coach for Camp Nolan Ryan was an honor and a tremendous experience that impacts his life on a daily basis. Geoffrey is very grateful to all the individuals that he has worked with and mentored, as well as his teachers, coaches, and mentors. They have all helped him in numerous ways. The rehabilitation field stresses the need to remain humble and open minded to learn, because all bodies react uniquely in specific ways. Sharing knowledge is the priority, we all learn from someone or somewhere. Geoffrey has spent 4 years as a Training Made Fun instructor and now serves an advisory role. Ryan Campbell, MBA, BS, PFT, is currently a sales manager for Snap Fitness in Green Bay, Wisconsin. He was the primary owner/operator of OC Fitness Solutions LLC in Newport Beach, California, an elite functional training and performance enhancement facility. 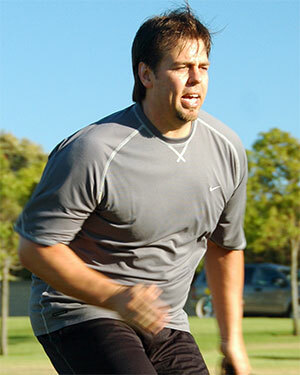 Ryan has over 16 years of experience as a Certified Personal Trainer. In his facility, Ryan concentrates his efforts training post-rehab strength and conditioning modifications for all populations. Ryan is also a consultant/instructor for hire. Currently working with the National Exercise & Sports Trainers Association (NESTA) where he also sits on the board of advisors. Ryan has earned a undergraduate (BS in kinesiology) and masters degrees (MBA), and several certifications, along with maintaining continuing education for all of them. He instructs on fitness concepts internationally and domestically as part of his experience with great companies such as NESTA, IDEA and Gold’s Gym. In the past Ryan has educated for Planet Fitness in Singapore, Gold’s Gym in Taiwan, and has been a lead presenter for various health and fitness organizations. Ryan’s fitness certifications include: Orange Coast College Fitness Instructor, Advanced NASM (National Academy of Sports Medicine), NASM CPT, NESTA PFT (National Exercise & Sports Trainers Association) and NCCPT (National Conference of Certified Personal Trainers). Ryan also possesses a Bachelors of Science Degree in Kinesiology emphasizing Biomechanics from The California State University, Fullerton, and a Masters in Business Administration from Keller Graduate School of Management, Illinois. Ryan’s previous experience, for nine years, was being an Advantage Trainer and Master Trainer for The Sports Club LA/Orange County, where he educated and mentored the staff outside of personal training. Ryan has lectured for NESTA, IDEA, NCCPT, Planet Fitness – Singapore, Gold’s Gym – Taiwan, Gold’s Gym – San Diego, Global Fitness, South Korea and Tsuda College of Physical Education, Japan among others. Ryan also has a successful background as a Physical Therapist Aid and various studies in Athletic Training. Ryan has been a Training Made Fun instructor and advisor since 2010. Jason Coates, BS, PFT, received his undergraduate degree in kinesiology (BS) from the University of Maryland. Jason has over 30 years experience in the health and fitness industry. He is fueled by motivating clients and the fact that they only get out of training what they put into it. He enjoys bringing his outgoing personality and unique regimens to make client workouts effective and fun. Jason is a former competitive natural bodybuilder and wrestler and currently enjoys working with and on computers, riding motorcycles and mountain bikes, and reading. Jason has been a Training Made Fun instructor since 2010. Kristin Godeke, JD received her law degree from Western State University, where she graduated as the 2007 Valedictorian. She obtained her undergraduate degree from Occidental College in Los Angeles, obtaining her degree in Diplomacy and World Affairs. Kristin now works as legal in-house counsel for Wells Fargo Bank in Irvine, CA. She was previously honored to have worked at Prenovost, Normandin, Bergh & Dawe, APC, a business litigation firm, working primarily with small business and financial institutions, where she represented and advised the executives of these entities in general business relations for more than 8 years. Her legal experience includes engagement in extensive business litigation, primarily involving contract disputes. Kristin has held an advisory role at Training Made Fun since its inception in 2009.